As expected, the White House press gathering at the Washington Hilton gave Obama the perfect setting to display his jovial side and lay down some of his staff’s well-scripted gags. Acknowledging his ‘lame duck’ status, the final term president joked that he would have to perform a Game of Thrones ‘Red Wedding’ style ambush to get legislation passed by Republican senators in Congress. The 44th President also aimed jabs at Donald Trump, Hillary Clinton and Bernie Sanders, as well as referencing college drug use. 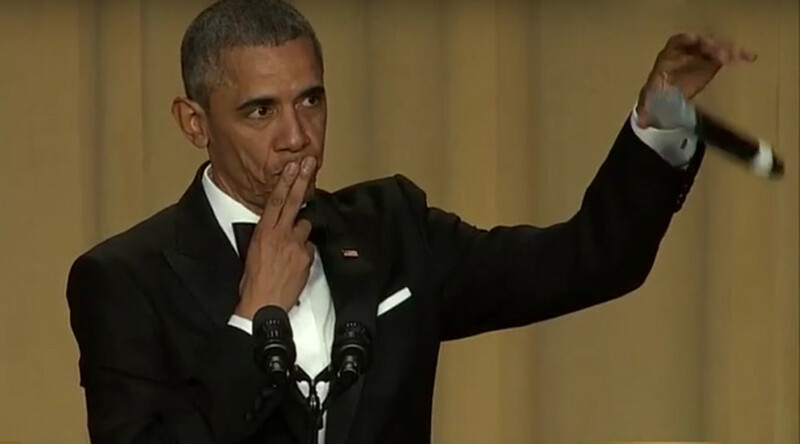 Obama closed his speech by doing what no US president has ever done before - a mic drop. “Obama out,” he declared. Social media went wild for the ‘badass’ move. Beyonce Knowles’ sister Solange chimed in declaring it the “greatest thing of all time,” and much of Twitter appears to be in agreement. This is the greatest thing of all time. Obama. Brought. His. Own. Mic. Obama poked fun at Trump, but the president was himself on the receiving end of some pointed jibes, as his follow-up act reminded him of his inability to shut down Guantanamo Bay. “I just got a note from the president saying that if you want another drink, you should order it now because the bar will be closing down,” comedian Larry Wilmore said.